Well, after subjecting the previous iPhone model, the 3GS, to a little bit of optical testing, we here at the lab have managed to gain access to one of the new specimens and have repeated our tests. And as promised, here are the results. Obviously the above image is a greatly scaled-down view. To see the whole thing, you’ll want to click here (sorry, slow-internet users). Right off the bat, you hold this phone in your hand and you see a HUGE improvement over the previous display. 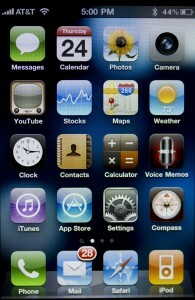 For the most part, the 3GS screen isn’t that bad when you look at it alone. 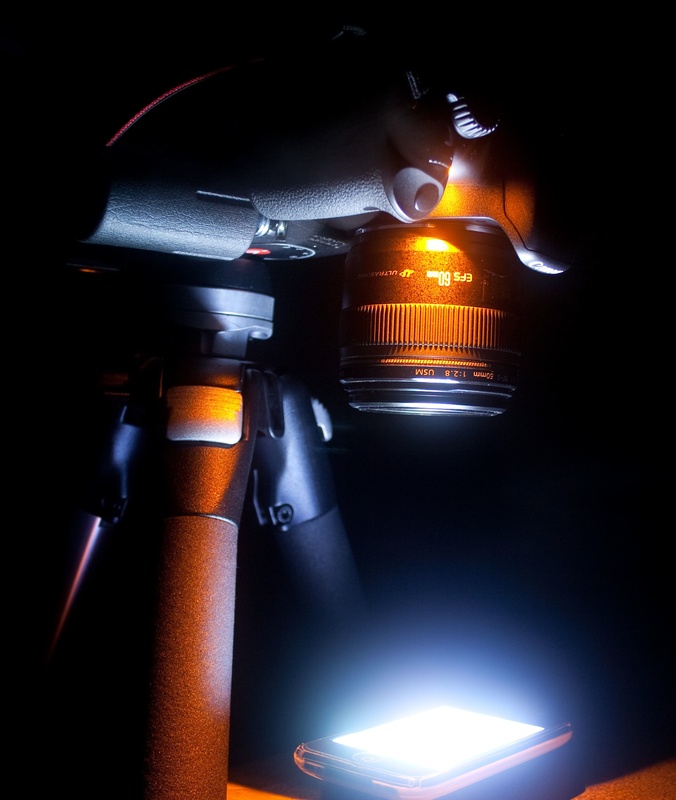 It does a pretty good job of doing what it has to do to deliver a decent image. 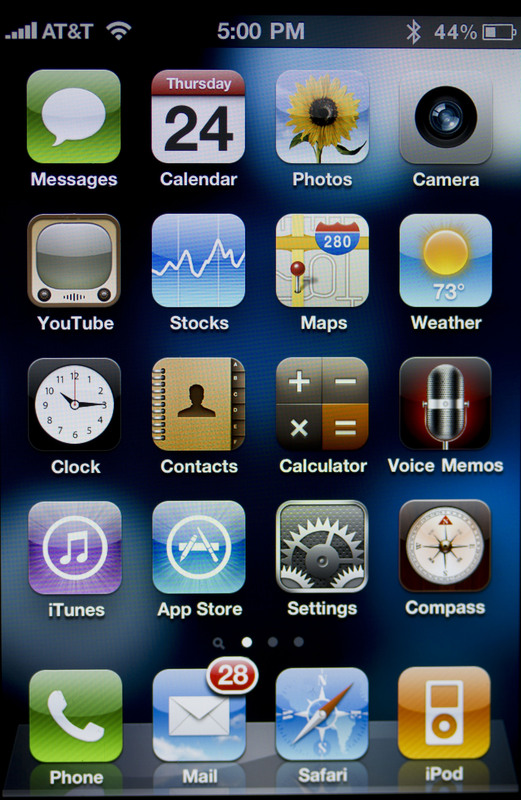 But the iPhone 4… wow. Just… wow. It’s incredibly crisp, and puts the previous generation screens to total shame. Is it like holding a sheet of paper in your hand, like Apple claims? No, not exactly. Paper still has a better crispness to it. But, this screen is still pretty damned clear. 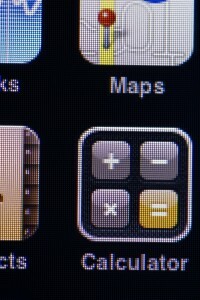 And at least to my eyesight, Apple is right: I couldn’t make out individual pixels. But, what about our little friend, with the much bigger eye and the much better eyesight? Again, this is reduced. Here’s the full size version. Long story short: yes, the Canon with the nice macro lens can still see the pixels on the new display. But, that doesn’t really tell us much. How does the new display stack up to the old one? And here of course, is the full-size image. 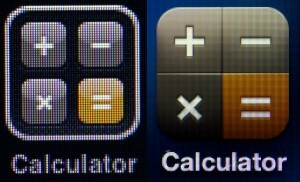 But even from the reduced image, it’s blatantly evident: there’s a BIG improvement between the old display and the new. 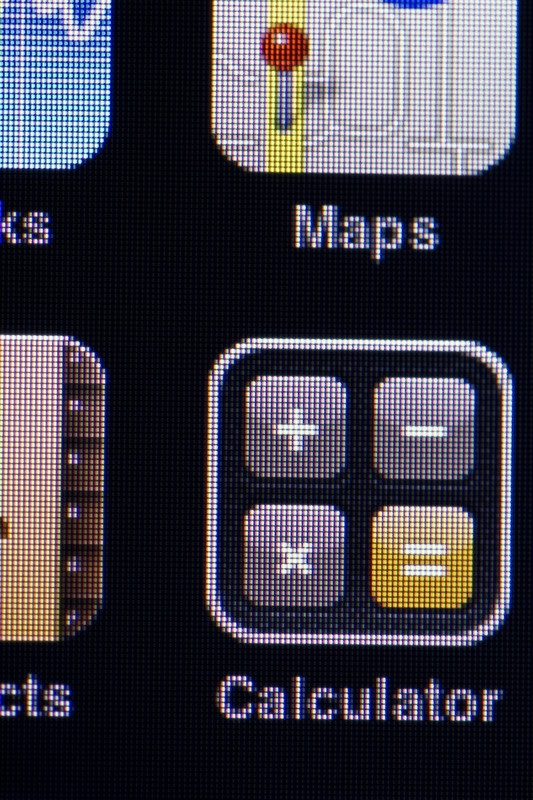 Apple’s hard technical figures are spot-on: there’s effectively a 4:1 pixel increase in the new display over the old one, and the resulting improvement is significant. 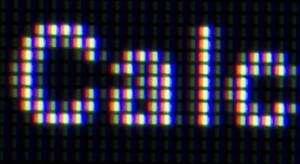 In fact, it’s actually pretty hard to go back to using the previous-gen display after playing with the new one for a while. Realistically and objectively though, is this alone worth the upgrade? For some people, I would argue yes, particualrly if you use your iPhone a lot. The new display is easier on the eyes, and has a nice vibrance to it. On the other hand, a casual user might get the same wow-factor from looking at the new screen but wouldn’t quite benefit that much. At the very least, there aren’t any iPhone apps as of this writing that absolutely require the better screen. Though, that may change in time. I certainly would wait until after the current waiting-line hysteria has died down. It should be clear to any reasonable that until the lines start to dwindle as the early adopters finally get their gadgets, the chances of getting one in the immediate future if you haven’t already are slim. Ironically, a mere two hours before the great iPhone theft debacle that occurred earlier this week, I was busy photographing my beloved (and now lost) cell phone for a little project I wanted to work on. 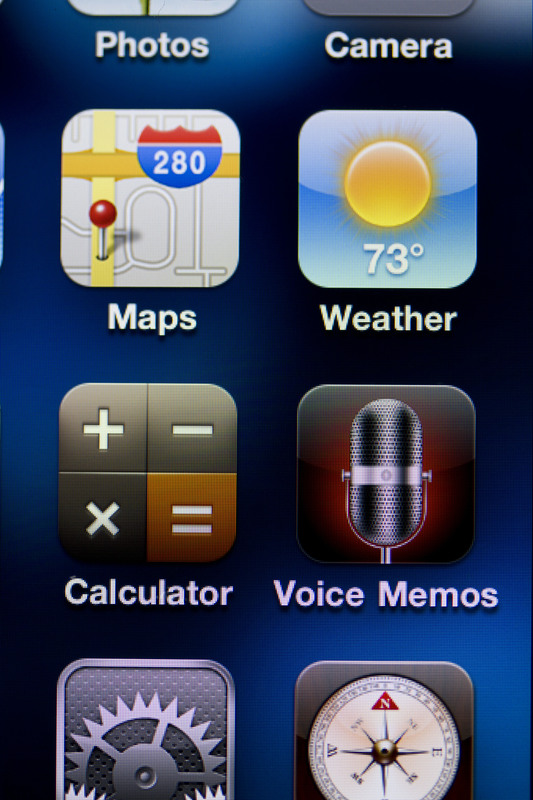 In particular, I wanted to see just what kind of a difference there is between the previous model’s screen, and that of the new iPhone 4. 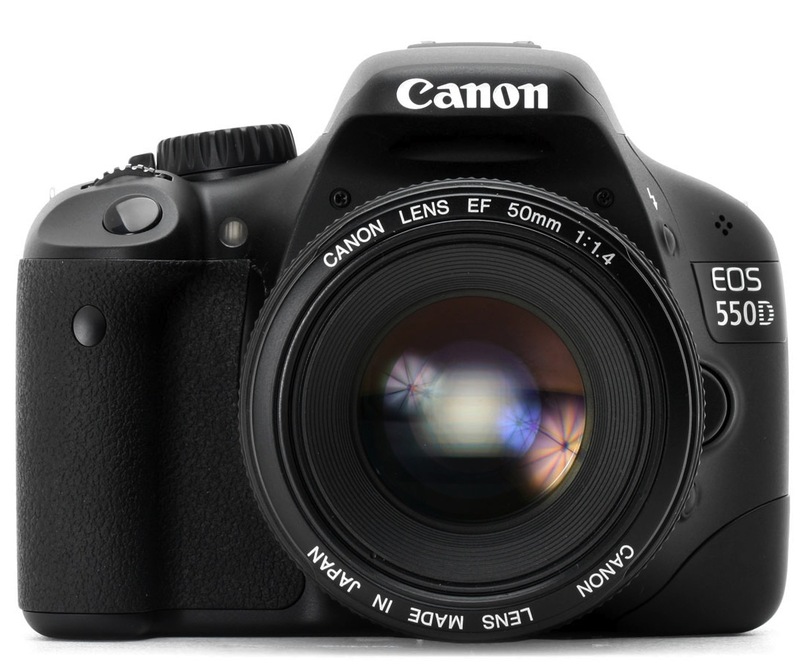 One of the new model’s oft-touted features is the retina display, which is purported to offer a resolution so high that the human eye can’t make out individual pixels. Whether this is true or not is subject to heated debate in the blog and pundit arena. But I’m willing to bet that although my own naked eyes might not be able to make out individual pixels on the new iPhone, I think I know an eye that can. 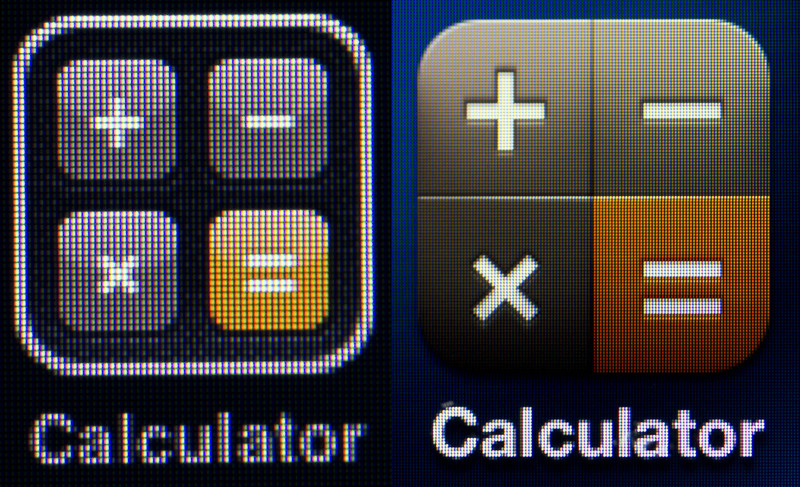 With the right optics and magnification, my current 18 Megapixel digital camera should be able to give me what I’m looking for: the ability to really compare, pixel-for-pixel, between the existing iPhone 3GS display and the new iPhone 4. While I still don’t have an iPhone 4 to test with, I figured I might as well get the first subject – the previous model – ready for its closeup, and then compare when I ultimately could get my hands on the new one. 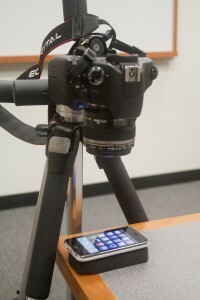 My Canon EOS T2i was fitted with an EF-S 60mm macro lens, and mounted directly above a comfortably-resting iPhone 3GS at the closest distance this lens will focus: 0.2 meters. Simple enough, and pretty straightforward as seen from the image above. Though I think the title shot, taken with lights-out over 25 seconds, with only the camera’s red-eye light and the iPhone display providing the lighting, makes it much more dramatic looking. The actual shots themselves were taken in complete darkness (aside from the display of course) and the camera set to 100 ISO. And the phone’s display brightness was set to full. And now, we can see through the power of high-end digital photography, that the iPhone 3GS screen is pretty damned pixelated! 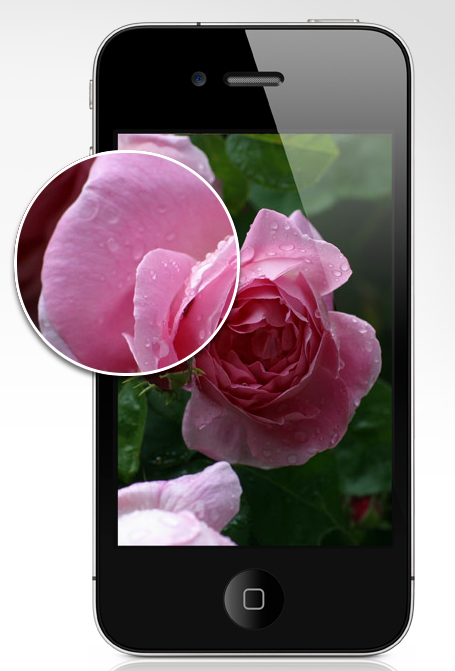 There are more images after the cut, showing additional examples of the screen at close range and at angles. 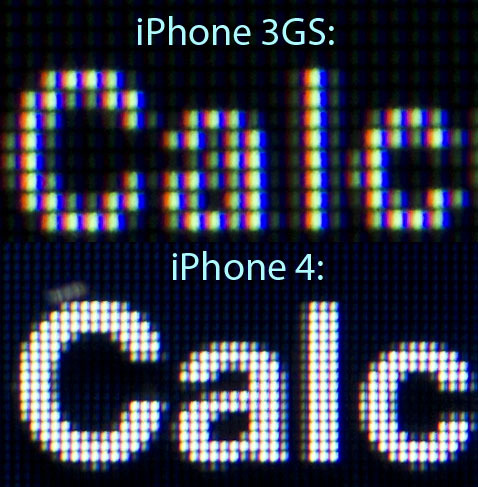 With any luck, I’ll be able to repeat this experiment with a brand new iPhone, and see what kind of difference a retina display can make.